If there’s a heaven, and if I go there, I would not at all mind eating a plate of this every day for the rest of eternity. Our friend Jeanine gave us a ton of peaches from the tree in her yard, the blackberries are from our own bushes. The bourbon is Rowan’s Creek. What’s this dish name? Where can I find the recipe? 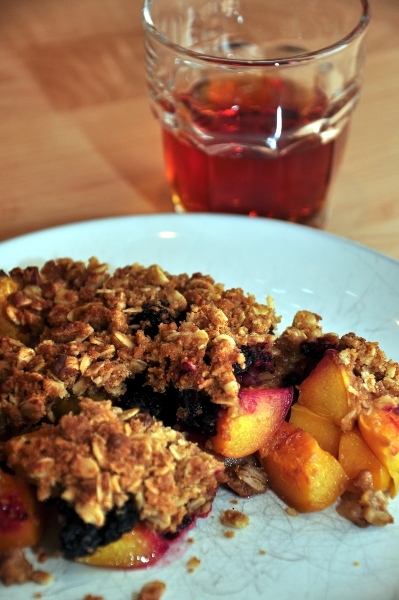 Hi Joel- It’s peach blackberry crisp. 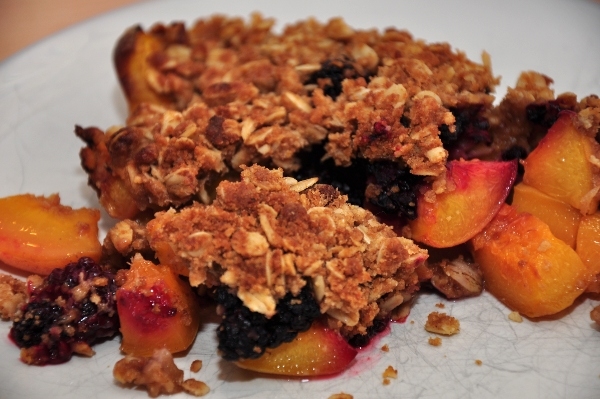 I don’t really have a recipe but basically you just put a layer of chopped peaches in a pie dish, put the berries on top, sprinkle with topping, and bake until the fruit is bubbly and the topping is browned. The topping is maybe 2/3 of a stick of melted butter added to a half cup each of brown sugar, flour, and rolled oats. Usually I also put in a bit of cinnamon, nutmeg, etc.